SalesWarp, a leader in advanced storefront management and e-commerce systems, announced they have launched a new marketplace solution now available for retailers. The SalesWarp Marketplace gives retailers the ability to create their own marketplace to compete with sites like Amazon and Rakuten (formerly Buy.com), while reinforcing brand positioning, strengthening customer relationships and improving retention. SalesWarp Marketplace is the next product line launched by the company. Following the success of their SalesWarp Enterprise product, the SalesWarp Marketplace creates another avenue for merchants to fully engage and capitalize on their multichannel and omnichannel strategies. Key to this strategy is the ability for retailers, including groups of retailers, to quickly build and maintain a successful online marketplace that is branded to their customer needs and allows for quick integration of new sellers and products into the marketplace. This capability coupled with fully integrated backend systems for the marketplace partners, will greatly accelerate time to market for retailers using this product while maximizing their investments in their current online stores built on Magento, DemandWare and other custom shopping cart solutions. The SalesWarp Marketplace gives retailers the ability to quickly tune their marketplace to the likes and needs of the target markets. They also have the ability to create an open or managed marketplace depending upon their own needs. With sophisticated and easy to use tools for on-boarding new sellers, and managing products, customers, orders and fulfillment – retailers are able to create a unique marketplace that drives more revenue and delivers a better customer experience. 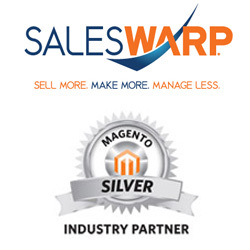 The SalesWarp Marketplace already has a major retail client building on the product and is being launched initially to run on the Magento platform in June 2013. Support will be available for other leading shopping carts as well as custom built in-house solutions. For more information on the SalesWarp Marketplace, email info (at) saleswarp (dot) com. SalesWarp, developed by 6th Street Inc., is a multichannel Storefront Management System that helps retailers improve how they manage products, orders and customers across multiple suppliers and web stores. This streamlines operations to significantly increase sales, improve overall quality and reduce costs.